My pool which includes a spill over spa holds about 15,000 gallons. The current pool pump is a Sta Rite Dyna Glass MPRA6F-148 ( 1 1/2 Hp motor ) single speed pump. The tank and trap body has a crack in it. Will the Pentair 340039 superflo high performance single speed pump be a good replacement option for my pool. Hi, Jim. 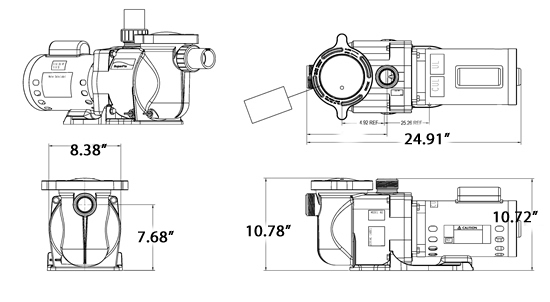 The Superflo Pump has a lower performing pump than the MPRA6F-148L pump. I would recommend the MPEA6F-206L. If you want to use the Superflo Pump, you will need the 2 HP - 340040. Does this pump (Pentair SuperFlo 1.5hp) come with all the O-rings etc I will need when installing it? I am replacing an old version of the same pump. Hi Samantha, Yes the Pentair SuperFlo will come will all O-rings needed for installation. You may need some basic plumbing fittings and glue based on your plumbing set up and those items can be picked up at local hardware store. I am replacing Pentair Superflow 1774528 with 1 1/2 HP pump .It looks like #340039 would be a good replacement pump. Do you have other suggestions? Are you looking to replacement the complete pump or just the motor? I have a pinnacle/Pentair pump (tag info) PF11-P1-1 1-02-F03 /34-2351 1-1/2hp 1 ph 60hz 115/230 Is your Pureline 1-1/2hp a drop in/do the inlet&disch ports still line up? will the replacement come with the quick disconnect unions? Thank you. A Answered on 1/3/2017 by InyoPools Product Specialist Scott W.
Which pureline pump are you looking at? Hi Gary, The Whisperflo Dual Speed Full Rate 1 HP Pump (011486) would be the recommended replacement. Current pump was not working anymore. First of all, take pictures of current pump and all connections (handy to reference during installation of new one). INYO sold the same pump offered by my pool guys for half the price. Got it here quickly. Installation was easy. Runs well. I'm very happy all the way around. Very dependable pump and love the screw on unions. (5 out of 5 stars) Great pump. Great service and help in selecting pump. Pump is very quiet. I purchased this pump for my daughter and son in law as a replacement pump for their pool. I purchased it because I have had this pump on my pool for over 10 years with no problems. I have not had the same luck with Hayward pool pumps.